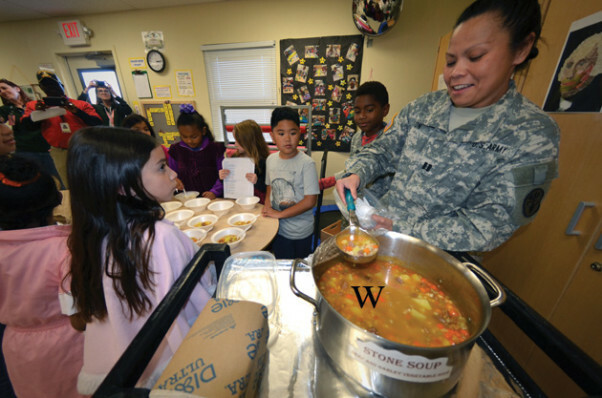 Children from Fort Irwin’s School Age Center enjoy Stone Soup with Capt. Angie M. Ison, Weed Army Community Hospital Chief of Nutrition Care Division, March 15. FORT IRWIN, Calif. — Weed Army Community Hospital’s Nutrition Care Division, along with the children and staff of Fort Irwin’s School Age Center (SAC), performed “Stone Soup” March 15 in celebration of National Nutrition Health Month. Fort Irwin’s adaptation of the play was designed to emphasize the pillars of health that increase an individual’s mental and physical performance. “Stone Soup is an old tale that illustrates performance triads: sleep, activity and nutrition,” said Capt. Angie M. Ison, chief of Nutrition Care Division. To make it even more relatable to the local community, the travelers from the story are Soldiers. In the play, the Soldiers are able to convince the villagers they can make soup from three stones. The three stones signify the three tenets of the performance triad: sleep, activity and nutrition. The Soldiers then sway the villagers to share their food to make the soup full of nutrients – potatoes and cabbage for vitamin C, carrots for vitamin A, meat for protein, barely for carbohydrates, with a dash of salt and pepper. Once they finish eating the soup, signifying ‘nutrition’, they sing and dance, which represents ‘activity’. Exhausted from song and dance, the Soldiers are then invited to the best beds in the village to ‘sleep’, the final pillar of the performance triad. WACH celebrates National Nutrition Month with an activity each week. This year, activities included a performance triad week, the Stone Soup production, a showcase of yogurt and juice-based smoothies, and a dance mob. For information about WACH’s Nutrition Care Division, visit http://www.irwin.amedd.army.mil/pages/nutrition.html.